Let The Dog Out Without Ever Getting Up | OhGizmo! I love my dogs, I really do. But sometimes when it’s quite late and I’m tired I would much rather let the dogs go out themselves and come back on their own. Dog flaps in the door aren’t an ideal choice since any critter can come in through something like that. 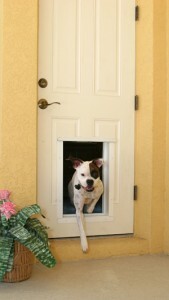 But this electronic dog flap from Pet Doors USA looks interesting. The flap is made of shatter proof materials and an aluminum frame. You put a RFID tag on your dog’s collar that will send a digital code to the doggy door to open when they approach it. It will close once the dog is no longer near it. It won’t close if there is anything obstructing it which means no snagged tails or paws. These go for $697 and additional RFID tags cost $30 per unit in case you need extras for multiple dogs. Just be sure your dog is trained to come back when it’s finished its business and not wander off through the neighborhood. The only Problem would be, if an intruder got hold of your dog, copied the tag and let him/herself into your flat… And that dog flap sure looks big enough! Typo fixed. The price is $697.